In 2018, a New York Times article listed the top 10 cities in the United States with the highest rate of eviction judgments in 2016. Five of those cities were in Virginia. Richmond, where our university is located, was number two on the list. Since that article’s publication, the L. Douglas Wilder School of Government and Public Affairs, and Virginia Commonwealth University as a whole, have been taking a closer look at root causes of eviction. We have been doing this through the RVA Eviction Lab, upcoming trainings through the Land Use Education Program and the adoption of, “Evicted,” by Matthew Desmond at VCU’s common book for 2019. The root causes of eviction are far-reaching, and there are many factors that come into play when we consider the extent to which a person will or will not be able to access stable housing. One of these factors includes the economic development of a state or community, which can affect access to affordable housing, employment opportunities and access to education. Other factors also include the extent to which housing, employment and education are funded through taxes. Through our public policy polls, the Office of Public Policy Outreach within the Wilder School’s Center for Public Policy has sought to understand how Virginians feel about some of these topics that can impact housing and eviction rates. Government support for private development of such housing. Government support for housing vouchers that can be used to pay some or all of a person’s rent. As is shown in the accompanying graphic, the majority (55 percent) of respondents said that they would not be willing to pay more in taxes to support either initiative. 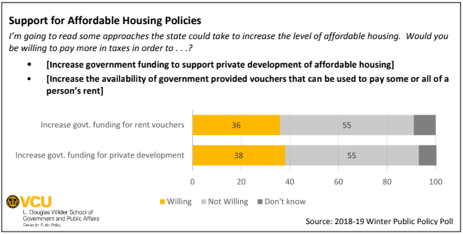 Regional breakdowns showed the Northwest and South Central areas of Virginia to be the least willing to pay more taxes for private development (62 percent not willing), with the Tidewater region (63 percent) being least willing regarding vouchers. Strategies to improve workforce development can also improve the financial health of individuals, helping them to build their savings and become more financially stable. At the time of our 2016-2017 winter poll, and still today, there has been a great deal of discussion about the role of workforce training in Virginia’s economy, with state residents viewing the availability of funding and training in their local area as important. Would individuals be willing to pay out of their own pockets to fund the sort of training that they deemed to be important? The poll asked respondents whether they would be willing to pay more in taxes in order to keep programs for workforce training and development going at the current level. Unlike the provision of affordable housing that was not generally favored by respondents, a clear majority (58 percent) said they would be willing to fund workforce training initiatives. While most age categories had 60 percent or more of respondents say they would be willing to pay more in taxes to keep current funding levels for workforce training, only 51 percent of those ages 45-64 said they were willing. Those who did not report having a child in public school were also more willing to pay more in taxes (61 percent) than were parents of public school students. Studies have also found that those with lower levels of education are also more likely to face eviction, raising questions about the adequacy of public schools. Findings from our 2018-2019 winter poll show that 70 percent of Virginians feel that current funding for public schools is not enough to meet existing needs. The poll also found that a clear majority of the public not only supports additional money for public schools but also would be willing to pay part of the bill through increased taxes. Sixty-three percent of Virginians indicate a personal willingness to pay higher taxes to increase funding for K-12 education, while 32 percent say they are not willing to do so. The proportion willing to pay higher taxes for this purpose is up 11 percentage points from the previous year, making it the largest year-to-year jump and the highest percentage measured in the 16 years the poll has asked the question. High rates of evictions in our communities are certainly concerning, yet it is encouraging that attention is being drawn to this matter. Data such as what we’ve described above can give policymakers a sense of how their constituents view strategies to address this issue, providing insight on how to better address some of eviction’s root causes. The Wilder School’s Center for Public Policy advances research and training that informs public policy and decision-making to improve our communities. Drawing on the wide-ranging expertise of Wilder School faculty, we services including leadership development and training, economic and policy impact analysis, survey insights, and program evaluation to clients in governments, nonprofits, businesses, and the public, across Virginia and beyond.